A travel scene in India? The Shri Swaminarayan Mandir a Hindu Temple in Neasden, north London. 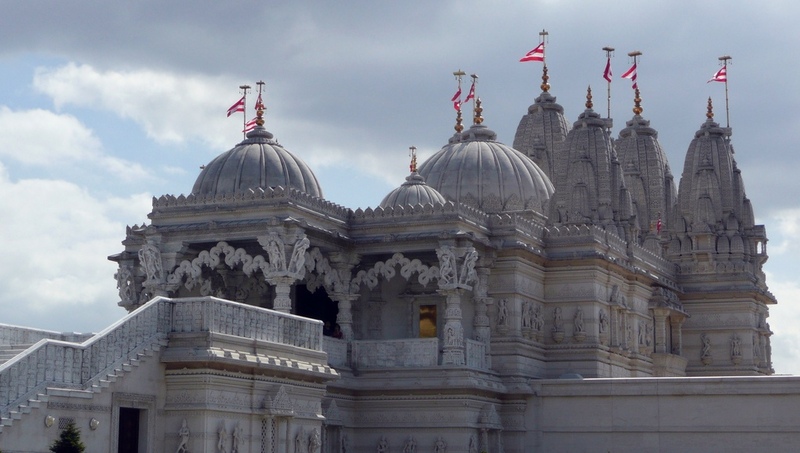 Image: Hindu Temple, Neasden, London by DavideGorla licensed under Creative Commons via flickr. Lee Thompson, cofounder of travel company The Flash Pack, set himself the challenge of travelling the world in just 12 hours. A video of his trip features Thompson meeting locals at a Thai temple, a Russian bath-house, a Lebanese belly-dancing show, and a Ghanaian food market amongst many other global destinations – all visited within the space of 12 hours. But, Thompson reveals at the end of the video, he did all this without ever leaving London. Inspired by the diversity and international nature of the city, Thompson claims he wanted to highlight the rich variety of authentic cultural experiences available within just one city. This might prompt us to ask (at least if you live in or near a place like London): why travel abroad at all? Thompson’s video certainly illustrates that exciting encounters with other cultures, peoples and foods can be had on, or near, our own doorsteps, without requiring lengthy and expensive trips. But Thompson’s adventure also highlights the important impacts that travel has on our destinations. Without so many people travelling to (and settling in) London, bringing aspects of their culture with them, this rich diversity of experiences would not have been possible. Such movement of people and the cultural exchange it brings has been a source of both excitement and anxiety across many different societies in the past and present. Anthropologists and historians have noted that the ‘traveller’ or ‘stranger’ can hold an ambiguous place in the cultural imagination; often seen as a powerful figure or a bringer of change, the ‘traveller’ is sometimes welcomed, sometimes feared. The Ancient Greeks would offer hospitality to a stranger in the belief that he may be a god in disguise, and this deification of the ‘stranger’ is seen throughout history and across cultures. In the New World, the Conquistadors were often welcomed first as gods but fear and hostility took over when the intentions of the newcomers became clearer. Indeed, the overwhelming changes that many settled people fear from travellers did come to pass in the New World, with native cultures overwhelmed and peoples enslaved. Nowadays, the ‘international nature’ of many cities is celebrated but often in tension with the fears of local populations about loss of their indigenous traditions. Such concerns play a part in national debates about immigration and sometimes the impacts of tourism too. Bhutan, for example, effectively restricts tourist numbers (through visas, tariffs and restrictions on tour operators) in order to create ‘low impact tourism’ that avoids the destructive effects on environment and culture that mass tourism can have. The Independent Transport Commission’s Why Travel? project examines these issues in depth, aiming to understand better why people travel and what impacts travel has on our lives. The project explores these questions from a broad range of perspectives across the arts, sciences and humanities, with the aim of informing better decision making to improve travel and transport into the future. For more information about the project, including news stories and expert views, see www.whytravel.org.